We have a herd of approximately 25 cows that enjoy free range and pasture throughout the entire year. This allows us to give priority to the well-being of our animals without putting in jeopardy the quality of our final product or the delicate balance of our natural environment. Our milk is certified organic by the Catalan Council of Organic Production (CCPAE) with the registration number 1648-P. This certification marks our commitment to traditional and organic cattle farming. Our work is fully integrated with the agricultural ecosystem we find ourselves in, boosting the natural biological cycles and maintaining and improving the fertility of the land for the long term. 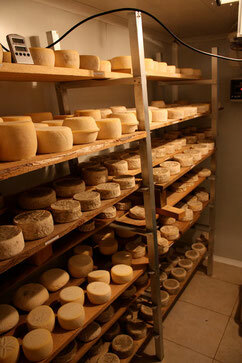 At Pujol-Orra Cheeses, we make artisanal cheeses from both raw and pasteurized milk. Since we have established a sustainable mode of production that minimizes the use of materials and resources from outside of the farm, the amount of our cheese production is directly linked to the volume of our milk production. Our production is mainly focused on the making of mature cheeses, but we also make fresh and creamy ones.